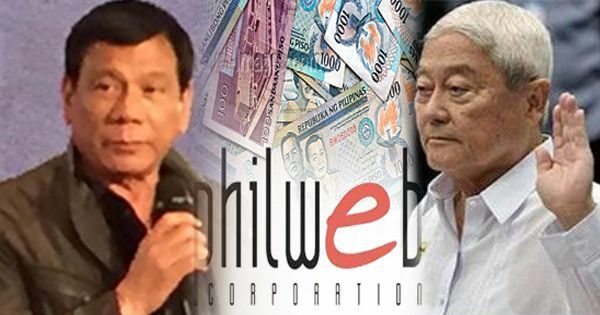 Gaming technology company PhilWeb Corp. is set to shutdown operations following President Rodrigo Duterte's promise to destroy oligarchs. It's main business, the e-Games network composed of e-Games stations (internet cafes exclusively offering casino games including baccarat, blackjack, slot machine games, video poker and sports betting), will have to close shop after the Philippine Amusement and Gaming Corp. (Pagcor) refused to renew its license. According to reports, PhilWeb's license to operate will expire at 11:59 p.m. on Wednesday, August 10, 2016. PhilWeb president Dennis Valdes, who insisted that the company is merely a provider of e-Games software and not online gaming, met with Pagcor chairman Andrea Domingo on Tuesday to appeal for an extension, but the gaming regulator still decided against renewing their license. The shutdown takes place a week after the President vowed to destroy the oligarchs that are embedded in government. In his speech delivered before members of the Parish Pastoral Council for Responsible Voting (PPCRV) in Malacañang on August 3, Duterte cited former trade minister Roberto Ongpin as an example of an oligarch who apparently used political connections to promote business interests. On August 4, Ongpin resigned as PhilWeb chairman saying he needs "to focus on real estate projects of Alphaland Corporation," a real estate company engaged in development and acquisition. Valdes, however, said in an August 7 statement that the business tycoon stepped down from his post "to save the company from possible shutdown." Ongpin's daughter, Anna Bettina, also quit as PhilWeb vice-chairperson and director. Ongpin is facing a P174-million fine imposed by the Securities and Exchange Commission in connection with an insider trading case involving his shares at Philex Mining Corporation. He was also disqualified to become part of the board of any SEC-listed firm. However, Onpin secured a 60-day temporary restraining order (TRO) from the Court of Appeals to prevent the SEC from implementing its en banc decision. The CA considered not the amount of fine imposed on Ongpin but the order for him to resign from his positions which affects not only Philex, but other publicly listed corporations. According to Valdes, the PhilWeb shutdown may "result in enormous economic and social costs." He said at least 5,000 employees of the e-Games network and the small and medium enterprises that supply goods and provide services to every e-Games outlet would suffer.